1. In a house, there are 5 lamps 25 Watt used 14 hours per day, a 200 Watt refrigerator used 24 hours per day, and a 125 Watt water pump used 8 hours per day. How much electrical energy used for a month (30 days)? Electrical energy used for a month = 52,5 + 144 + 30 = 226,5 kilo Watt hour = 226,5 kilo Watt hour = 226,5 kWh. 2. 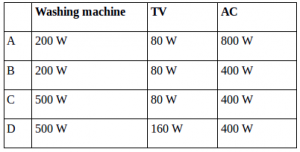 A house using electrical tools as listed in the following table. How much electrical energy is used for 1 month (30 days)? Total energy = 12 kWh + 30 kWh + 18 kWh = 60 kWh. 4. A family uses electrical energy for a month (30 days) for tools as in the following table!